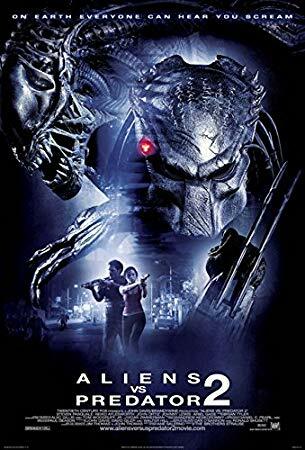 Just as Predators is the bleak Ginger Rogers to the originals’ perpetually flexing Fred Astaire, Aliens vs Predator: Requiem is the Community theatre riff on AvP. There’s a bunch of great ideas here, but in every case they’re either sabotaged by the direction or damaged by the passage of linear time. And right away, there’s your problem. The Alien franchise was never more creatively lost than during the long, unlovable period where it decided the alien was kind of sort of a chimera that took on genetic aspects of its host. Big chunks of Alien 3 toyed with this, it would become central to Alien Resurrection, and, God help us, Covenant and it never once played as anything other than a cheap way to add more drama. Worse, here it takes the unnecessary ‘Or IS it? !’ Ending of AvP and builds on it in the most obvious way possible with the Predalien. Worse still, it turns what should be a chimeric and horrifying bastardization of two icons into a mcguffin with two sets of jaws. That in turn leads to the worst moment, arguably, in both franchises, where the Predalien impregnates a maternity ward worth of women with both a terrible metaphor and a tedious plot development. And the weird thing is most of this would be fine if you could ever see the bloody thing. The Brothers Strause seem to have decided to embrace the combined aesthetics of the two franchises a little closely, meaning basically the entire movie happens at night in either forests or industrial facilities. It doesn’t really matter because basically nothing here is easy to see or follow. Initially that presents as an aesthetic choice. After a while, you get the sneaking suspicion that its cover up the two men in monster suits carefully hitting one another. That’s what kills the movie. The action should be innovative and easy to follow and it’s sometimes the first and never the second. Shane Salerno’s script is short on characters but massive on big, fun ideas. Even the Predalien should work and the bits that do (Death frisbee! Wolf!) make it through still have to battle the foggy, dour production style to be seen. If it’s an aesthetic choice it’s too far. If it’s a budgetary choice, it’s way too obvious. Which is such a shame because there’s a fun movie struggling to be seen here. ‘Wolf’ the veteran Predator sent to clean up the mess is especially fun. Likewise the idea of having twin protagonists meet in the middle is flat out great. But, neither Dallas or Kelly quite land as anything other than parts of the plot that happen to have dialogue. You want to care, but at no point does the film let you and that’s a particular shame when you get to the end of act two and the genuine surprise that waits there. This is a film with absolutely its fair share of good ideas. It just never lands them. I know this all sounds like I’m busting on an easy target but Requiem is a fascinating example of what happens when script and direction are a million miles apart. This is, on the page, never less than competent. On the screen, rarely more than it. You can plot a straight line from Tremors to the movie version of Phantoms (In which Affleck was, of course, the bomb yo) through Requiem and up through movies like Eight-Legged Freaks and Slither to, arguably the two part movie version of It. In all these cases the basic premise is ‘Something awful versus small town America’ and in each case these movies build on their compatriots. Phantoms’ sweaty palmed sense of menace is very much present in the second half of Requiem. Eight-Legged Freaks uses some of the exact same plot beats as Requiem as do the early Resident Evil movies and so on. This is a field continuously teaching itself how to be, a monster continually writing itself into existence and while Requiem isn’t successful, in many places at all, it’s a vital part of that process. Which is the only approach to evolution the movie even comes close to getting right.